Defender, Piki & Curious Films - 100 min. 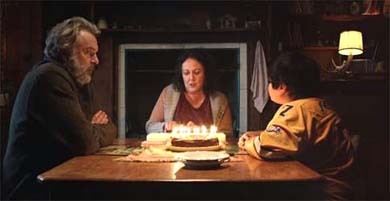 Principal Cast: Sam Neill, Julian Dennison, Rhys Darby, Rima Te Weata, Rachel House, Oscar Kightley, Tioreore Ngatai-Melbourne, Troy Kingi, Cohen Holloway, Stan Walker. Crew: Screenplay: Taika Waititi from the Barry Crump book 'Wild Pork and Watercress'; Director of Photography: Lachlan Milne; Editors: Luke Haigh, Tom Eagles, Yana Gorskaya ; Production Designer: Neville Stevenson; Costume Designer: Kristin Seth; Makeup Designer: Dannelle Satherley; Composers: Luke Boda, Samuel Scott, Conrad Wedde; Producers: Carthew Neal, Leanne Saunders, Matt Noonan, Taika Waititi; Director: Taika Waititi. Ricky is a defiant young city kid who finds himself on the run with his cantankerous foster uncle in the wild New Zealand bush. A national manhunt ensues, and the two are forced to put aside their differences and work together to survive in this hilarious and heartfelt adventure. I found this a somewhat strange dark comedy, one that includes a number of deaths and physical pain. I think I am going to need a second viewing. SPECIAL NOTICE: This comedy is so popular that in its 26th week of record breaking New Zealand cinema history, it was even outdoing all of the Hobbit films at NZ box offices. Starting 14 September 2016, a PAL R4 DVD can be purchased from New Zealand and Australian sources for about $30nz or $25au. It is presented in a 2.39:1 format, 16x9 enhanced, with a DD Surround 5.1 English language track. On the same date, there is an All-regions Blu-ray release, selling for about $40nz and $30au, with DTS-HD-MA 5.1 and LPCM 2.0 English language tracks. 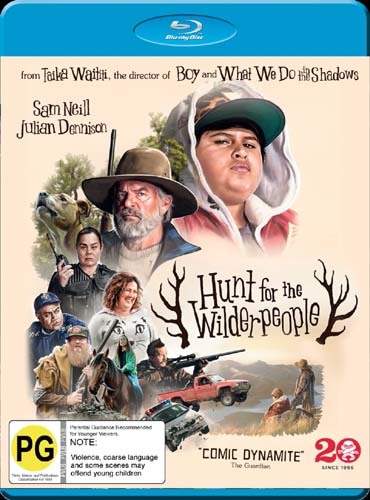 Extras on both DVD and Blu-ray include: Audio commentary track with Taika Waititi, Sam Neill and Julian Dennison(DD 2.0); a featurette(3:21); bloopers(2:25); trailer((2:34); Interviews: Taika Waititi(5:23), Sam Neill(3:09), Julian Dennison(2:51), Rhys Darby(2:56), Stan Walker(0:23), Rima Te Weata(2:58), Barry Crumb's agent(0:55), Taika Waititi on Barry Crumb(1:25). Everything is shown in 1080p except the Interviews which are 1080i. The BD has four unrelated trailers for: 'People Places Thing', 'The Young and Prodigious', 'Shooting for Socrates' and ' A Month of Sundays'(9:16). A region 1 NTSC DVD is listed as being available starting 27 September 2016 in the US and Canada, selling for $15-20. It has subtitle options in English, French and Spanish. It also has the same extras as listed above for the New Zealand/Australian offerings. A BD-R Blu-ray will become available in the US starting 25 October 2016 - tech details forthcoming. NOTE: There are DVD and Blu-ray offerings at various US, Canadian and other sites that are the Australian discs, but not being indicated as such. They will have a source of "import" or "madman". They will also show a release date of 07 October. I would not recommend ordering these unless you mean to order an R4 DVD or Region B Blu-ray. As of 16 January 2017, it is available on Region 2 DVD and Region B Blu-ray from UK sources, selling for about 10#. It would seem to have the same extras as the one released from New Zealand and Australia, with the exception of the cast interviews. There are also English subtitle and Audio description options. Starting 27 March 2017, a Region 2 DVD and Region B Blu-ray will be available, with a title of 'Wo die Wilden Menschen jagen', and contains spoken options in English, German, Spanish, Hungarian, Polish and Russian. It also contains subtitle options in: German, English, French, Italian, Portuguese, Spanish, Bulgarian, Croatian, Czech, Danish, Dutch, Estonian, Finnish, Greek, Hebrew, Hungarian, Icelandic, Latvian, Lithuanian, Norwegian, Polish, Romanian, Russian, Serbian, Slovak, Slovenian, Swedish and Turkish. It will sell for about 14eur(DVD) and 17eur(BD). Starting 05 April 2017, it will become available on Region 2 DVD and Region B Blu-ray from Spanish sources, with the same spoken and subtitled language options indicated in the German release of 27 March with an aka title of 'La Caza de los Ñumanos' and sell for about 10eur. Starting 10 April 2017, it will become available on Region 2 DVD and Region B Blu-ray from scandinavian sources, subtitled in Finnish, Swedish, Danish, Norwegian and English. No known soundtrack cd of this title as of 06 August 2016.